Born to Don Allen, one of the Tornado Twins, and his wife Meloni, daughter of President Thawne, in the 30th Century, Bart Allen is the grandson of Barry Allen and is the second Kid Flash and (albeit for a very brief run) the fourth Flash. 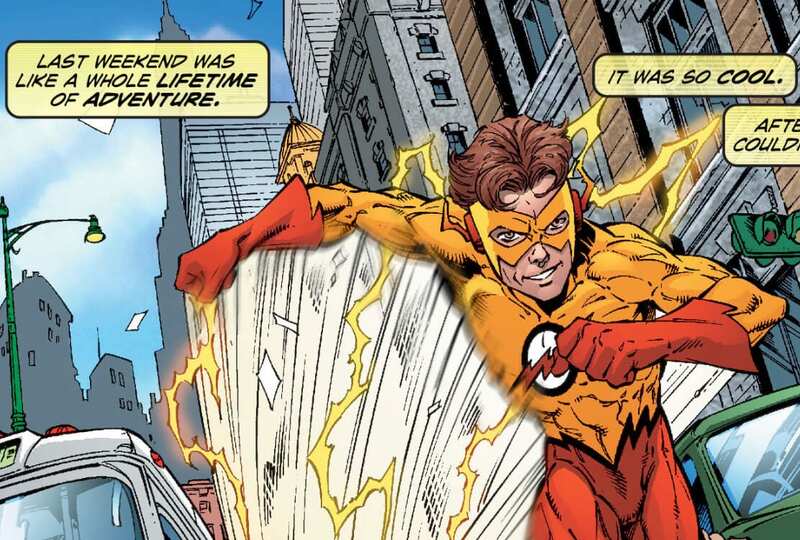 Bart Allen has also served on more teams than most other speedsters combined, including the Legion of Superheroes, Young Justice, the Teen Titans, and the new Titans. Created by the team of Mark Waid and Mike Wieringo, Bart’s first appearance was in Flash Vol 2 #92 in 1994. His origin and history are incredibly complex and involve a lot of time travel (thanks, Mark Waid), but we’ll go through the shorthand version. A lightning-fast aside before I begin: this article will not cover the “Bart Allen” of DC’s New 52 continuity; that iteration of Kid Flash was not truly Bart Allen as he is currently known, but rather Bar Torr. Bar Torr is unrelated to Barry Allen, and his powers do not come from the Speed Force. With that out of the way, let’s get on to the star of this week’s Friday Flash Facts! 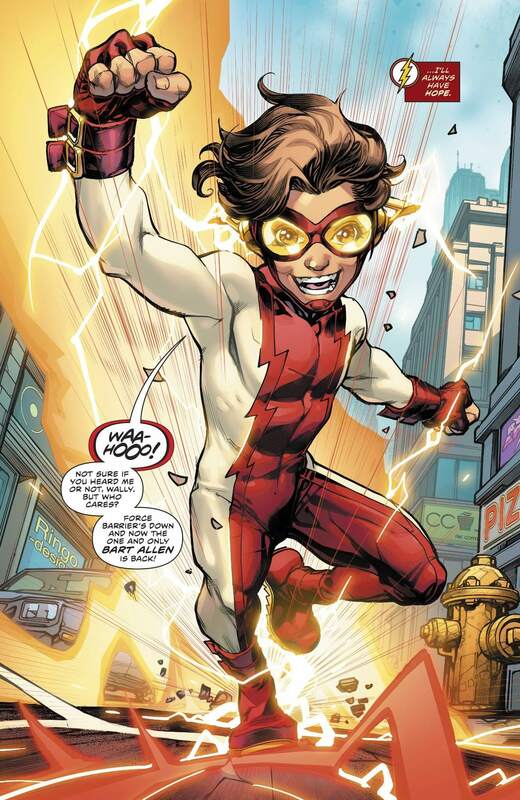 Bartholomew “Bart” Allen II was born in the 30th century with his grandfather’s speed. This Speed Force connection at such an early age, however, caused him to have an unstable metabolism, resulting in him aging at a hyper-accelerated rate. His maturity reflected as such, looking twelve but in reality only being two and possessing the attention span of the latter. This short attention span and the impulsiveness that goes along with it contributed to him adopting the name Impulse. After President Thawne and the Dominators killed his father and aunt, and his subsequent capture by the 30th Century’s Earthgov, it was learned that his Speed Force-enhanced metabolism was going to result in an early death for Bart. With his volatile aging threatening to kill him, Bart’s grandmother Iris brought him to the 20th Century to be trained by Wally West, her nephew and the third Flash following the events of Crisis on Infinite Earths, in the hopes that his knowledge of the Speed Force could save her grandson. After helping Wally and the other speedsters defeat Kobra, he was taken under the wing of Max Mercury in Machester, Alabama and further trained to use his powers. Bart continued to learn how to access the Speed Force and best make use of the abilities that came with it, soon becoming one of the founding members of Young Justice. When Max Mercury disappeared into the Speed Force, Bart Allen was taken in by Jay Garrick and his wife Joan, and it was around this time that the Young Justice team also broke apart and Bart received an invitation to become a member of the new Teen Titans weekend training club alongside Tim Drake (Robin), Raven, Cyborg, Starfire, Beast Boy, Wonder Girl, and Superboy. Wally West was initially against this decision, having little faith in the upstart speedster’s ability to follow direction and bear the heavy burdens that come with being on a team like the Teen Titans. Early in his team’s adventures, an ego-driven Impulse fought a losing battle with his fellow Teen Titans against a Jericho-possessed Deathstroke, who blew out Bart’s knee with a point-blank shotgun blast. This became a “growing pain” of sorts for the hot-headed and impulsive speedster who then took it upon himself to gain a little maturity by speed-reading every single book in the San Francisco Public Library and retaining the knowledge he procured from it – finally rebranding himself as the new Kid Flash, just as Wally West had before him. 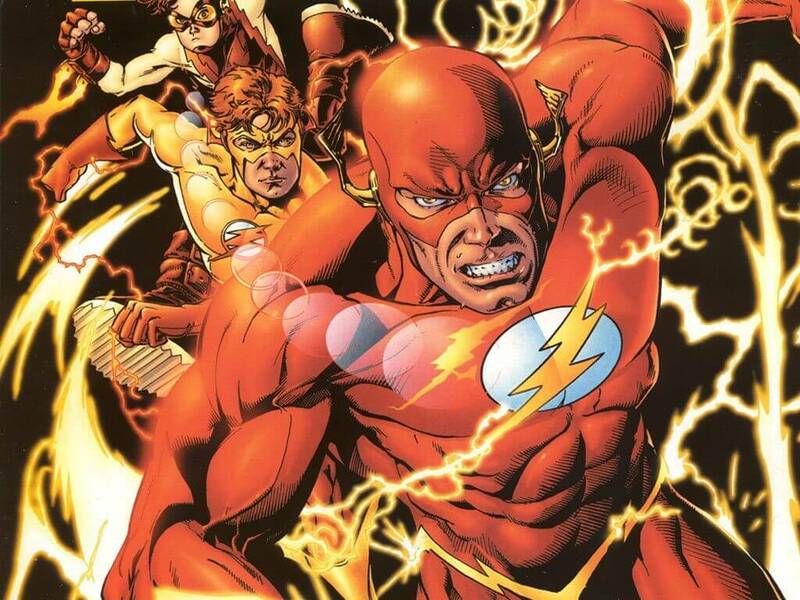 During the Infinite Crisis event, Bart Allen – along with Wally West and Jay Garrick – attempted to trap the rampaging Superboy-Prime within the Speed Force. As tends to be the case when speedsters travel too fast, bad things happened, and Jay burned himself out while Wally was turned into pure Speed Force energy and absorbed into it. Alone with Superboy-Prime, Bart’s fate was to be certain death at the hands of the rampant villain, but his grandfather Barry Allen, Max Mercury, and Johnny Quick, all of whom had been trapped within the Speed Force prior to the event, temporarily appeared to aid the young speedster and successfully trapped Superboy-Prime. After this, Jay Garrick claimed that the Speed Force was gone as he could no longer feel its energies. The truth, however, was that it had been absorbed, in its entirety, by Bart, and it had also, by consequence, aged him further. It was at this time that Bart donned his grandfather Barry’s old costume, explaining to his teammates and mentors that it had been the sole thing to survive the trip back from the unknown dimension where he’d been for several relative years. After using up all of the residual speed energy left in his body, Bart offered Barry’s costume to Jay and told him that he was once again the fastest man alive (it had been quite a few years since Jay held claim to that title). Bart Allen donned the mantle of the Flash for a very brief period, despite his connection to the Speed Force threatening to kill him, and it took the ingenuity of some of S.T.A.R. Labs’ finest to modify one of Barry Allen’s old costumes so that the connection wouldn’t kill him outright. He had aged even further, now a young man, and began working for Keystone Motors and subsequently applied to work in the LAPD forensics department, as his grandfather had before him. He heroically sacrificed himself in a battle against Inertia and the Rogues in order to save the city of Los Angeles, though he was eventually returned to life as well as simultaneously being cured of his rapid aging and Speed-Force-trying-to-kill-him problems thanks to reabsorption into the Speed Force, being returned into a teenager and once again taking on the name of Kid Flash. In the events of Final Crisis, Bart once again went toe-to-toe with Superboy-Prime and – with the help of Brainiac 5 reviving Bart’s friend and former teammate, Connor Kent from the dead – the two friends were able to at last send the villain back to his own Earth, powerless. Unbeknownst to Bart, another result of Final Crisis’ conclusion was Wally West helping Barry Allen return to their plain of existence. This revelation was met with hard skepticism by Bart who, in truth, wanted his former mentor Max Mercury to return from the Speed Force as well. When it was revealed that his newly-reinstated-to-life grandfather was becoming the new Black Flash (Death for speedsters) and had vaporized Savitar, Bart’s problems multiplied. The now out of control Barry had rushed off to return to the Speed Force so that he could no longer be a threat to his friends and family. The result of this, however, had been the return of Eobard Thawne, who wasted no time in attacking the Flash Family, first targeting Wally’s twins Jai and Iris “Irey” West II. Bart Allen and Jay Garrick came to the aid of the Wests but were both soundly handed their butts by the Reverse Flash, who then, scoffing at the young Kid Flash for being a blood perversion as a descendant of both the Allen and Thawne bloodlines, threatened to stab Bart with his lightning bolt staff. Bart finally got his wish granted, however, as Max Mercury returned from the Speed Force with the help of Wally, and together the Flash Family contained and defeated Thawne. Complicating his life more after the happy reunion were the events of the Blackest Night crossover, in which the personification of Death, Nekron, corrupted Bart, along with a host of other deceased heroes and villains, with a Black Lantern Corps power ring. It was only through the efforts of Wally and Barry, and their mutual connection to the Speed Force, that the ring’s power over Bart was broken and he was once again among the living (and no longer a blood-lusting Black Lantern). Bart Allen is a Speed Force Conduit just like his fellow Flash and Kid Flash counterparts, and as such he has all of the general powers and abilities gifted to the rest. Bart has had more opportunities to learn about the Speed Force than any speedster preceding him, having studied under the tutelage of Wally West, Max Mercury, Jay Garrick, and (to a lesser extent) Barry Allen himself. As such, Bart has developed abilities that are at this point unique to him: true PHOTOGRAPHIC MEMORY allows Bart to remember everything he speed-reads permanently, unlike other speedsters who generally lose the acquired information shortly after they gain it. Bart’s other unique power is the ability to generate SPEED SCOUTS, Speed Force energy clones of himself which he can send out anywhere and then re-absorb them to gain any knowledge they acquired. This energy clone ability is seen by one other speedster in DC Rebirth: Godspeed, who claims while fighting against Barry Allen that he can do what no other speedster can: be in two places at once (I guess Godspeed hadn’t done his required Flash Facts reading!). Up until the final pages of the recently concluded Flash War event, Bart Allen had been MIA in the DC Rebirth’s present continuity in all forms. Impulse fanatics were doing headspins upon the revelation that their favorite cocky kid from the future had made his triumphant return. This goes in line with the spirit of Rebirth as a presentation and how DC wants to treat their continuity as a whole, with many other pre-52 era speedsters making returns (or subtle hints at returns, in the case of Jay Garrick) and the once immature and impulsive young member of the Flash Family may have many more adventures ahead of him. While he started off being fairly disliked by the Flash fanbase, Bart, through his maturation over the years, earned the respect of his peers and mentors alike, as well as gained his own fanbase. He’s still a far stone’s throw from being the best, and with his current status still in question, it’s tough to say how Bart Allen will grow further as a character or become more skilled as a speedster.